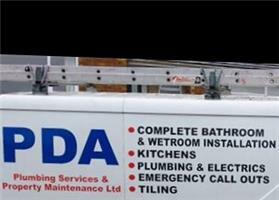 PDA Plumbing Services and Property Maintenance Ltd - Bathrooms, Plumber based in Fareham, Hampshire. If you are looking for a highly skilled sole trader with over 15 years’ experience within the property maintenance trade, who has built up a variation of skills and knowledge and specialises in bathroom renovations…then look no further than PDA Plumbing Services and Property Maintenance Ltd. I am happy to offer you a FREE design service, where you can see how your finished bathroom would look before any work has begun. I will then project manage the job with most of the installation being carried out by myself (including all plumbing, tiling, general carpentry etc). If any electrical work is necessary I have a highly reputable electrician that I will use and have a very good relationship with: with this work you will also get a certificate to sign off the electrical work.I consider myself to be a very conscientious tradesman who carries out my work in a very methodical way, ensuring that the finished work is perfect and that you and I are 100% satisfied. Some of the areas of expertise that I cover include:whole bathroom installations wide range of tiling, including swimming pools, gravity system installations and general plumbing. Should you notice any gaps through my feedback, this is because of the time that I genuinely spend on a project and on many occasions I am asked to carry out extra works throughout the property because my knowledge covers such a vast range of skills.